I haven't been able to find much on the other changes to Paradise Pier, so I decided to glomp the rest of the changes together, with some opinions in between the informative stuff. The changes to the area include the removal of the Maliboomer, the change of the Orange Stinger, Golden Dreams, Mulholland Madness, and the Sun Wheel and the addition of World of Color and Cars Land. And that's not even including all the rethemeing of the area and whatnot. Thanks to MouseTimes forums and Micechat's Project Tracker for most of this information! We'll start off with the removal of the Maliboomer. I thought it went well with the theme of a boardwalk, but most people seemed to think it was an eyesore. 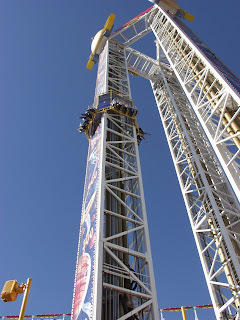 While I never actually rode it (though I have been working up the courage), most of the reports that I have heard is that it is very intense and some outright hate it. I can't really agree or disagree with anyone on this one. The removal should start in 2009 and finish in late 09. Don't really know what Imagineers are planning to do with the spot. Next up is change of the Orange Stinger to the Silly Symphonies Swing. It sounds as if the ride is to be based off of "The Band Concert". The middle column will be painted like a tornado and will spew out smoke effects. Atop the ride will be a conductor Mickey seen from all sides of the Pier. I have barely any info on this one, so I really have no idea what will happen to the giant "orange" they have, whether it will be repainted or anything. The idea of a swing blends in with the boardwalk theme of the area, but I don't feel either an orange or a mickey short fit in. I guess it is possible that at one point in planning this huge project, the Imagineers just rethemed some things for the sake of rethemeing them, a fact that I think is really disappointing because the budget spent on pointless change could be put to better use somewhere where change actually needs to occur. 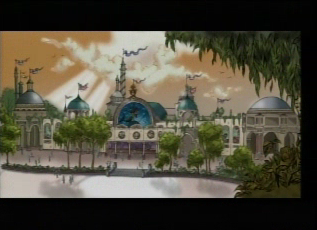 The project should start in 09 and finish in 2010 with the Mulholland Madness retheme and the World Of Color show. Golden Dreams is also set to be demolished and changed into an attraction based on The Little Mermaid. I wonder how varied this attraction will be from the already-existing Voyage of the Little Mermaid at Disney's Hollywood Studios. 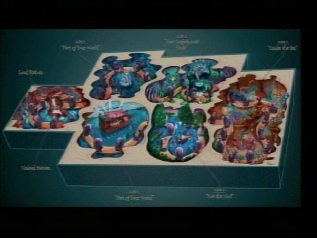 From the concept art, clammobiles will travel through seven rooms, one of which may be a loading/unloading room themed to be part of the story (I'm really unsure of this but in the picture I saw, there wasn't any space outside of the story rooms for a load/unload). I have heard that the facade of the attraction will be shaped like a giant sand castle with interactive play on one side, but I have also seen concept art of a fancy building like the one above (think Toy Story Mania but a bit more water themed, like the Ariel's Grotto restaurant). I don't know which the Imagineer's are likely using, but it will probably be the latter fancy building idea to save costs. I can't imagine them going with what is likely to be the more expensive approach on a tight budget. As for the loss of Golden Dreams, I don't think that this is a bad attraction at all. It's not something I have to see every time I got to the park, but its not something I will purposefully skip. I understand that Golden Dreams was to be a much better show, but was lost to budget cuts and became the more historical version than the Disney version they were planning. I rather wonder if the show would have been much more appealing to guests had that not happened. I was hoping to finish this post tonight, but it is now very late and I do need to go to bed. I will post the rest of the changes tomorrow. I'm really sorry about that, but I don't really have a choice in the matter with only half of what I wanted to talk about done in about an hour and a half. I will also be gone on a small trip to the mountains from Thursday to Saturday, so don't expect any posts then. I will hopefully post a rather good historical article then. No hints on what this will be about but I will say that it is something that has been closed some years and it's only at Disneyland. See ya all later! The Future of the PeopleMover...? I used to live in California and am a self-proclaimed Disney Addict. I have been to Disneyland many more times than I can count and have been to Walt Disney World twice as a guest. I follow many Disney sources and love to learn any new bit of Disney news and trivia. Rikua is my online name, and you can find me in a few online communities. I have a sister who inspired me to follow my dream of working for Disney after she completed two programs at Walt Disney World (Hollywood Studios and Fantasyland Merchandise). I'm currently working my own College Program in Attractions at Epcot, and continuing to wish upon a star that one day I may become an Imagineer. Subscribe to Disney on the Brain!